Heterochromatin is a specialized form of DNA packaging that results in a transcriptionally inactive conformation. While much progress has been made in characterizing the heterochromatin structure biochemically and via its effects on genes and transgenes, very little is known about how heterochromatin formation is initiated. Recent evidence from the yeast Saccharomyces pombe suggests the involvement of the RNA interference (RNAi) machinery in heterochromatin formation, and in particular in the targeting of the heterochromatin machinery to specific sites in the genome. In this article, we review the evidence for an involvement of RNAi in heterochromatin formation in the model system Drosophila melanogaster. 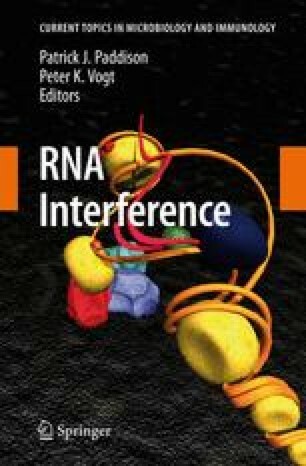 It appears that while there are numerous threads that connect heterochromatin formation and gene silencing with the RNAi pathways in Drosophila, a direct role for RNAi in particular in the targeting of heterochromatin formation is still lacking.